Located on the lagoon of Grand Cul de Sac with its 600-foot beachfront, minutes away from Gustavia airport, this new 52-room hotel opts for chic, simple and natural.Some suites have a garden, a swimming pool, a terrace, with the ability to be interconnected.White, wood, soft blue decoration are in harmony with the landscape and the ocean. The hotel is made of authentic materials to blend in with nature. Foremost, Le Barthélemy hotel offers bespoke service by a team that attends to your every desire. At the Barthélemy, everything is designed for your satisfaction: ocean view suites with a living room, garden, terrace and private pool, duplexes and volumes that are flexible according to your desires. You will find the famous luggage rack by James Lenglin Design. The facilities are also specially adapted with handicapped access. 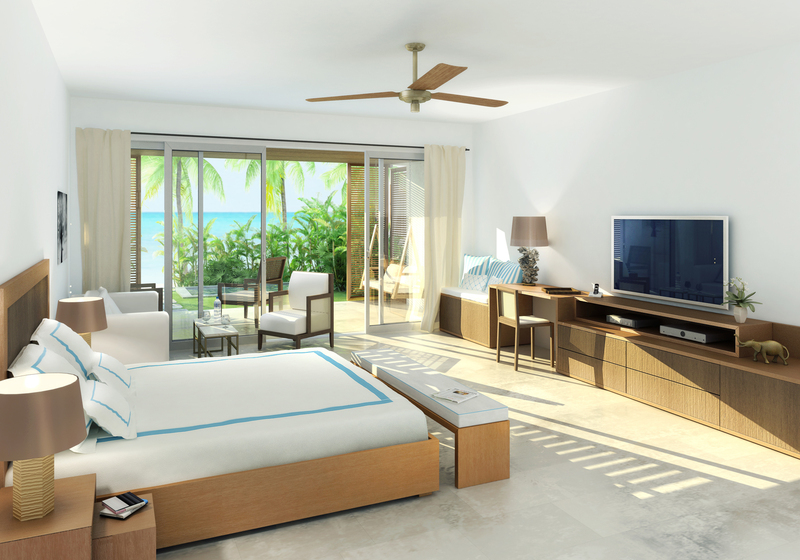 The environment is clear, warm, and with colors that harmonize with the sea, sand and tropical vegetation. The pristine white predominates, wood brings authenticity and modernity, and blue accents the signature of luxury and refinement. The comfort and beauty of the rooms combine hi-tech equipment and exceptional quality of service.